A resource for assisting secondary school students in working on assignments. 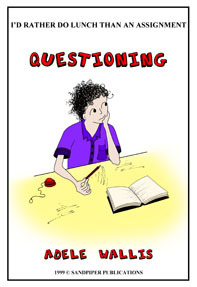 Questioning, is the first in a series of five, which looks closely at each step of the assignment writing process. Questioning shows teachers and other professionals how to help students understand the assignment question using a number of strategies. These strategies emphasise making a visual representation of the question, in order to clearly present the different parts and how they relate. The resource also links into learning strategies such as six thinking hats, Bloom’s taxonomy of learning and multiple intelligences. It has been clearly written for teachers, with student forms, which help to explain and work through the various strategies. The student pages are presented as black line masters for individual, whole class or small group work.